Hazmat teams responded to a hazardous material spill at Cambridge Major Chemical Company in Germantown on Tuesday, August 6th 2013. The hazardous material that was spilled is called, therminol. The toxic chemical is said to be used in heat transferring processes used by the company. Officials stated that a valve on a vessel that was containing the hazardous material failed, causing the hazmat leak. The hazardous materials liquid, therminol, spilled into a self-contained sump, and did not enter any waterways or spill into the sewer system. 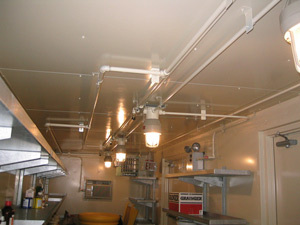 Secondary sump containments are very important when housing or storing hazardous materials liquid. In the event of a chemical spill, the leak-proof secondary containment sump is able to catch and contain the chemical safely. Officials stated that the chemical, therminol, gave off a vapor, which triggered an alarm system that notified Germantown hazmat crews. Suppression systems were not used. The building was cleaned up by hazmat crews and employees were able to reenter the toxic-free building. Safe and reliable CHEMLoc storage buildings offer your investments with assurance. Constructed to be non-fire rated, the CHEMLoc storage building offers unmatched chemical storage solutions. EPA, OSHA, NFPA approved as well as FM Approval and Warnock Hersey safety approvals make this building completely compliant. Manufactured from heavy-duty, 12 gauge steel for ultimate chemical storage applications. Our CHEMLoc storage buildings from US Chemical Storage offer weathering resistance from the harshest environmental conditions and a chemical resistant epoxy for increased durability. Completely customizable to fit your unique specifications. Our wide variety of customizable accessories provide you with unmatched chemical storage protection when storing hazardous materials liquid.